NOTE: Companies are requested to submit individual files for each employee they plan to hire! The fee will be calculated according to the National Bank of Romania official exchange rate on the day of the payment. Important: The beneficiary's IBAN number along with owner's and employer's name (if applicable) must be referred to on the proof of payment! 1. Diplomas from Moldova do not need any form of authentication. Diplomas issued before 2008 (and diplomas issued after 2008 which cannot be verified on line) shall be accompanied by a Certificate of Authenticity from the Ministry of Education of Moldova which shall be submitted in original. 2. The Hague Apostille is requested for diplomas from countries which are parties to the Hague Apostille , issued by the competent authorities in the issuing countries. The Hague Apostille is requested for diplomas from Italy, Greece, Spain, Portugal and Cyprus. Legalization/Authentication exemption is allowed under the law of an international treaty to which Romania is party or on a reciprocity basis. The processing time is 30 days from the date of registration of the application, which should include proper and complete documentation. If considerable research or correspondence to obtain necessary information is required, during unusually busy periods or when circumstances beyond our control prevail, the time span as indicated above may be extended. The certificate is issued to the holder or to a person authorized by power of attorney. In case of loss, partial or complete damage of the certificate, a duplicate can be issued upon submission of official request and the following documents: copy of the diploma which was recognised; copy of personal identity document; evaluation fee of 50 lei; a notary statement regarding the loss or damage of the certificate – original. 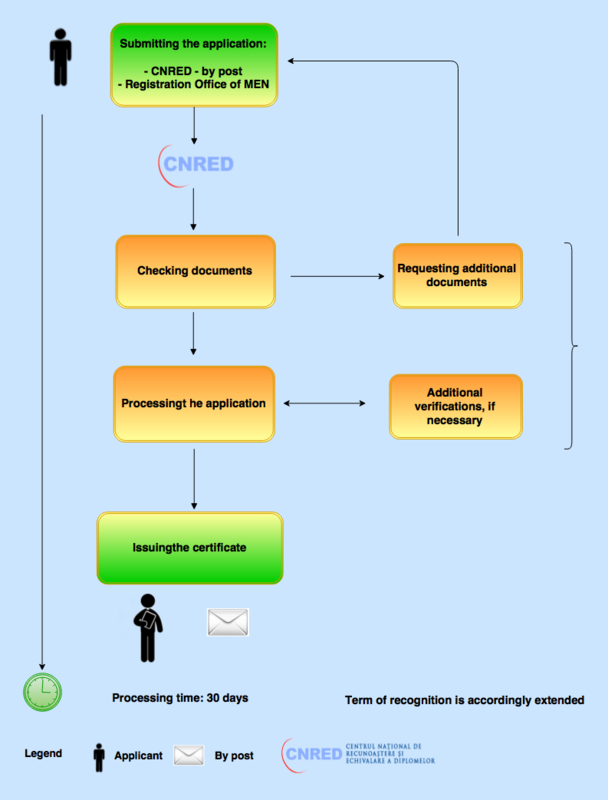 CNRED’s decision on recognition can be appealed once within 45 working days from the day the applicant received the decision. CNRED issues an answer within 60 working days. The time span indicated above may be extended if considerable research is required, and an information is given to the applicant via post or email. The procedure applicable for study recognition in order to obtain the work permits for citizens of third countries can also be consulted in Point of Single Contact and Electronic Procedures.